Alexander Calder. Photographema Caroli Van Vechten (1947). 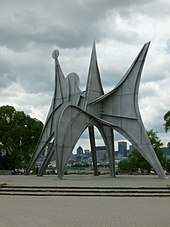 Alexander Calder (Lawnton Pennsilvania 22 Iulii 1898; Novi Eboraci 11 Novembris 1976) late habetur unus e sculptoribus Americanis saeculi vicensimi maximi momenti. Publicis sculpturis abstractis mobilibusque multa novantibus innotuit, sculpturis kineticis motris ventisve motis, quorum ratio aesthetica fortem invocabat. Empennage (Francogallice L'empennage ab artifice appellata) (1953). Pinacotheca Artis Modernae Nationalis Scotica. Tectum acusticum (1953). Aula Magna Universitas Media Venetiolana Caracis Venetiolae. Quattuor elementa, installatio pro aditu (1961). Museum Modernum Holmiae Sueciae. Vermilingua (Francogallice Le tamanoir ab artifice appellata) (1963). Roterodami Nederlandiae. Tres alae (Suecice De tre vingarna ab artifice appellata) (1967). Blå Stället ad Angered Gothoburgi Sueciae. Sine nomine (1968). Centrum Culturale Bethlehem Lisboae Portugalliae. Tres orbes, uno carente (1968). Franklin Parkway Philadelphiae Pennsilvaniae. Fusus (Francogallice Bobine ab artifice appellata) (1970). Pinacotheca Nationalis Australiana Canberrae Australiae. Halebarda (1971). Museum Sprengelianum Hannoverae Germaniae. Crinkly avec disque rouge (Francogallice ab artifice appellata) (1973). Schlossplatz Stutgardiae Germaniae. Folium arboris (Francogallice Feuille d'arbre ab artifice appellata) (1974). Tel Aviv Israelis. Civitas (Hispanice La Ciudad ab artifice appellata) (1960). Pinacotheca Artis Nationalis Caracis Venetiolae. Tres orbes (Francogallice Trois disques ab artifice appellata), pro Expo 67 facta. Insula Sanctae Helenae Parc Jean-Drapeau Monte Regio Quebeci. Designatio Americana Australiana ad aeroplanum Braniff Douglas DC-8-62 adhibita. Photographema ad Miami International Airport anno 1975 facta. Baal-Teshuva, Jacob. 2002. 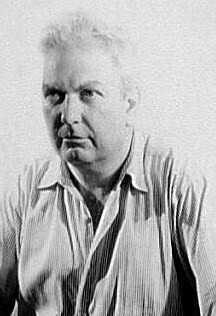 Alexander Calder 1898–1976. Coloniae: Taschen. ISBN 3822879150. Calder, Alexander. 1966. An Autobiography With Pictures. Pantheon Books. ISBN 9780394421421. Calder Hayes, Margaret. 1977. Three Alexander Calders: A Family Memoir. Paul S. Eriksson. ISBN 0839780176. Guerrero, Pedro E. 1998. Calder at Home: The Joyous Environment of Alexander Calder. Novi Eboraci: Stewart, Tabori & Chang. ISBN 9781556706554. Perl, Jed. 2017. Calder: the conquest of time: the early years, 1898-1940. Novi Eboraci: Alfred A. Knopf. ISBN 9780307272720. Prather, Marla. 1998. Alexander Calder 1898–1976. Vasingtoniae: National Gallery of Art. ISBN 9780894682285. ISBN 9780300075182. Rosenthal, Mark, et Alexander S. C. Rower. 2005. The Surreal Calder: The Menil Collection. Hustoniae. ISBN 9780939594603. Rower, Alexander S. C. 1998. Calder Sculpture. Universe Publishing. ISBN 9780789301345. Thalacker, Donald W. 1980. The Place of Art in the World of Architecture. Novi Eboraci: Chelsea House Publishers. Wolfe, Alexandra. 2014. Famous Artists Send Greeting Cards: An exhibit in New York showcases nearly 60 holiday cards from major artists. The Wall Street Journal, 19 Decembris. Zabel, Barbara. 2012. Calder's Portraits 'A New Language. Vasingtoniae: Smithsonian Institution Scholarly Press. Vicimedia Communia plura habent quae ad Alexandrum Calder spectant. Alexander Calder. Pinacotheca Artis Nationalis. Opera Alexandri Calder. Institutum Smithsonianum. Biographia Alexandri Calder. Collectio Guggenheimiana. Ludibria Calderana. Museum Berkshire ad Pittsfield Massachusettae. Dux chartarum familiae Calder-Hayes. Bibliotheca Bancroftiana. Pagina historica de Braniff Flying Colors. Novissima mutatio die 16 Iunii 2018 hora 03:25 facta.